Research was published this week showing the financial cost of methane being released from Earth’s permafrosts. But the risks go beyond financial – Earth’s history shows that releasing these stores could set off a series of events with calamitous consequences. The sediments and bottom water beneath the world’s shallow oceans and lakes contain vast amounts of greenhouse gases: methane hydrates and methane clathrates (see Figure 1). 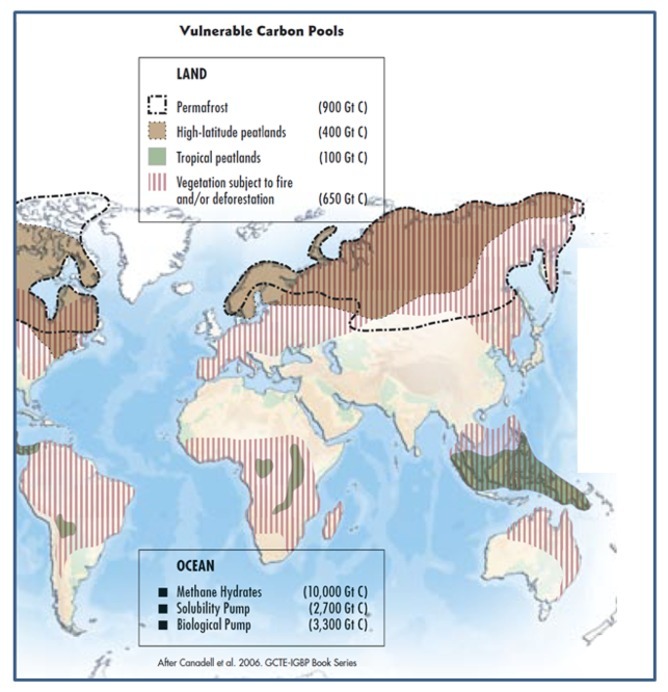 In particular methane is concentrated in Arctic permafrost where the accumulation of organic matter in frozen soils covers about 24% of northern hemisphere continents (see Figure 2a) and is estimated to contain more than 900 billion tons of carbon. 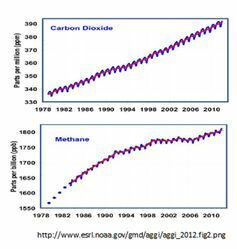 Methane, a greenhouse gas more than 30 times more potent than CO2, is released from previously frozen soils when organic matter thaws and decomposes under anaerobic conditions (that is, without oxygen present). 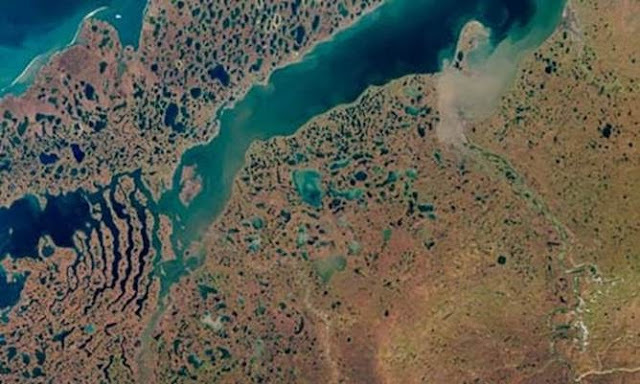 Most of the current permafrost formed during or since the last ice age and can extend down to depths of more than 700 meters in parts of northern Siberia and Canada. Thawing of part of the permafrost has not yet been accounted for in climate projections. The Siberian permafrost is in particular danger. A large region called the Yedoma could undergo runaway decomposition once it starts to melt. This is because elevated temperatures cause microbes in the soil to decompose, which causes heat, which creates a self-amplifying process. Evidence of melting of permafrost has also been reported from the dry valleys of Antarctica, where development of thermokarst (small surface hummocks formed as ice-rich permafrost thaws) has been reported, reaching a rate about 10 times that of the last ~10,000 years. 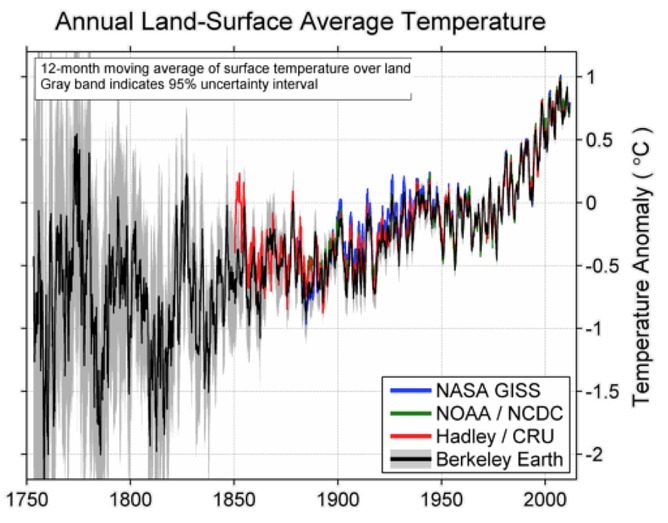 The mean temperature of the continents has already increased by about 1.5C. With sulphur aerosols masking some of the warming, the real figure may be closer to 2C. Arctic air temperatures are expected to increase at roughly twice the global rate. A global temperature increase of 3C means a 6C rise in the Arctic, resulting in an irreversible loss of anywhere between 30 to 85% of near-surface permafrost. According to the United Nations, warming permafrost could emit 43 to 135 billion ton CO2 (GtCO2) equivalent by 2100, and 246 to 415 GtCO2 by 2200. The geologically unprecedented rate of CO2 rise (~2.75 ppm/year during June 2012-2013) may result in faster permafrost collapse. Already measurements along the Siberian shelf uncover enhanced methane release. 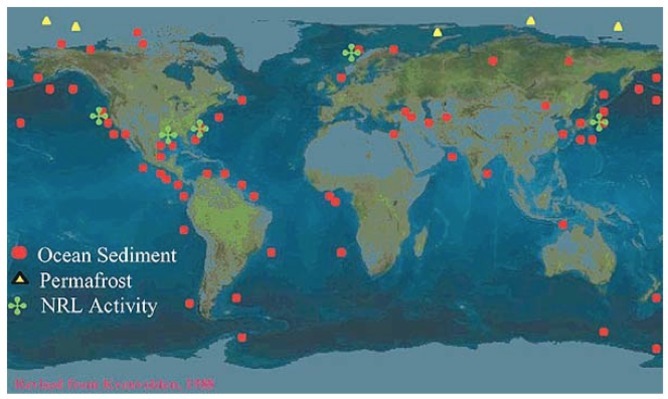 In 2010 a Russian marine survey conducted more than 5000 observations of dissolved methane showing that more than 80% of East Siberian shelf bottom waters and more than 50% of surface waters are supersaturated with methane. Atmospheric methane levels (during glacial periods: 300–400 parts per billion; during interglacial periods: 600–700 ppb) have recently reached 1850 ppb – the highest in 400,000 years (see Figure 2b). Hansen et al estimate that the rise of CO2 forcing between 1750 and 2007 has already committed the atmosphere to between +2 and +3 degrees Celsius, currently mitigated in part by sulphur aerosols. Hansen refers to the “Venus Syndrome”, drawing an analogy between the enrichment of Venus’ atmosphere in CO2 (its atmosphere is 96.5% CO2 and its surface temperature is 462C) and potential terrestrial runaway greenhouse effects. This needs to be placed in context. On Earth, weathering processes and oceans draw down the bulk of atmospheric CO2 to be deposited as carbonates. It’s therefore impossible for Earth to develop Venus-like conditions. But the onset of a hyperthermal – a huge release of carbon such as happened during the Paleocene-Eocene Thermal Maximum 55 million years ago, with an attendant mass extinction of species – is possible. 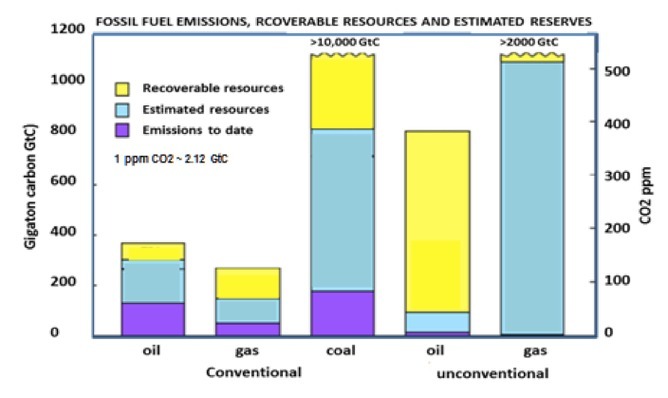 Extraction and combustion of the current fossil fuel reserves (more than 20,000 billion tonnes of carbon – Figure 4) would inevitably lead to a hyperthermal commensurate with or exceeding the PETM. 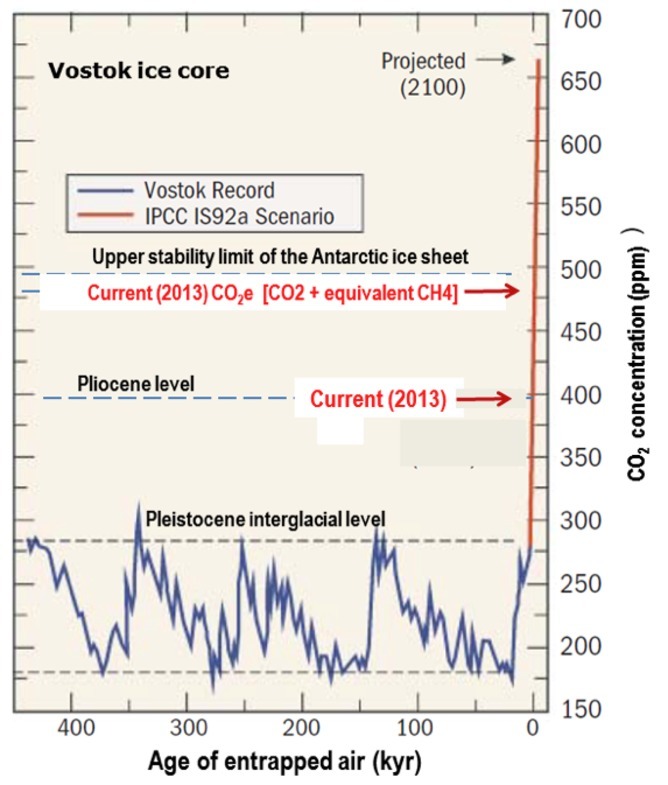 If that happens, CO2 would rise to above 500ppm (see figure 4), temperature would rise by about 5C (figure 5) and the polar ice sheets would melt – it’s a future we could face if emissions continue to accelerate. Not that the above features too much in the Australian elections, where the reality of climate change has been replaced with pseudoscience notions, including by some who have not consulted basic climate science text books, and by hip-pocket-nerve terms such as “carbon tax”, “emission trading scheme” or “direct action”. The proposed 5% reduction in emissions relative to the year 2000 represent no more than climate window dressing. Nor are coal exports mentioned too often, despite current exports and planned future exports, which represent carbon emissions tracking toward an order of magnitude higher than local emissions. According to Dr Adam Lucas of the Science and Technology Studies Program at University of Wollongong, Australia (with ~0.3% of the global population) currently contributes domestic emissions of about 1.8% of global emissions. The total domestic and overseas consumption of Australian coal is responsible for more than 2% of global emissions. Plans to triple or even quadruple coal export volumes over the next 10 years would raise Australia’s total contribution to global GHG emissions to toward 9% to 11% by 2020 – an order of magnitude commensurate with that of Middle East oil. Which places the “Great moral challenge of our generation” in perspective. Andrew Glikson does not work for, consult to, own shares in or receive funding from any company or organisation that would benefit from this article, and has no relevant affiliations. This article was earlier published at The Conversation.